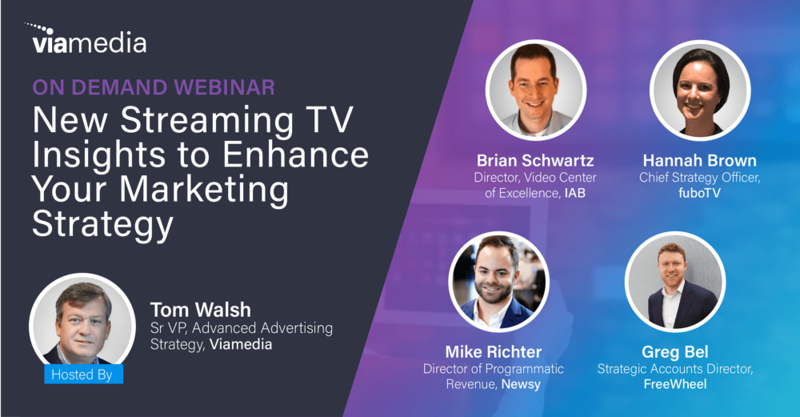 Viamedia hosted a widely attended industry webinar March 27, 2019 to discuss the latest insights into Streaming TV (OTT) and how marketers are best leveraging the fast growing television platforms. The panel was led by Viamedia’s own Tom Walsh, Sr. VP of Advanced Advertising Strategy and joined by expert panelists: Brian Schwartz, IAB; Greg Bel, FreeWheel, A Comcast Company; Michael Richter, Newsy, A E.W. Scripps Company; and Hannah Brown, fuboTV. OTT is a main stream distribution channel for content and advertising with over half of the US population using their connected TV’s to stream video & projected to rise over the next few years. OTT blends the best of digital with the best of linear to emerge as the medium of choice for premium video allowing marketers to connect with audiences in their most engaged moment. 73% of adults 18+ who typically watch streaming OTT video say they watch ad-supported OTT video according to IAB’s research on Ad Receptivity and the Ad-Supported OTT Video Viewer, Oct 2018. Ad Supported OTT is a Valuable Audience: Younger/Kids in Household/Higher Earning/More Diverse/Male according to IAB’s research on Ad Receptivity and the Ad-Supported OTT Video Viewer, Oct 2018. Marketers interested in the streaming TV insights delivered during panel can download the webinar on demand or contact us for more information info@viamediatv.com. Contact us today for an OTT strategy consultation!